Hello friends and thanks for checking in with my One Room Challenge! 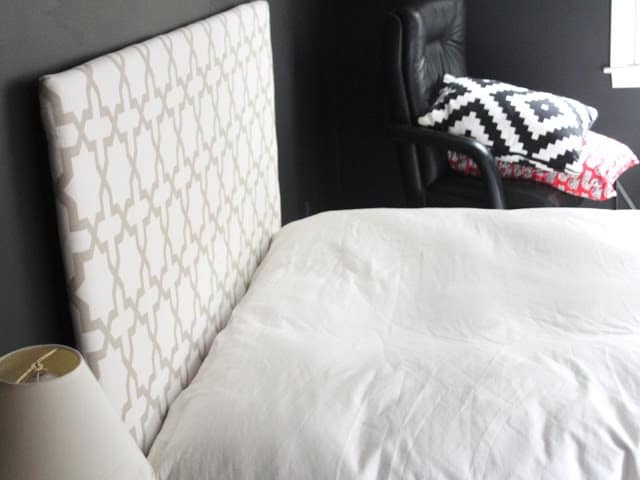 If you’re a newbie here, I’m working on the Moody Masculine Mighty Teen Room Makeover. That is, I’m making over my 17 year old son’s room that was in dire need for more storage, better function and a better representation of him and his interests. We left off last week with a staining-palooza happening in my garage. a warm tone that I love with the black walls! 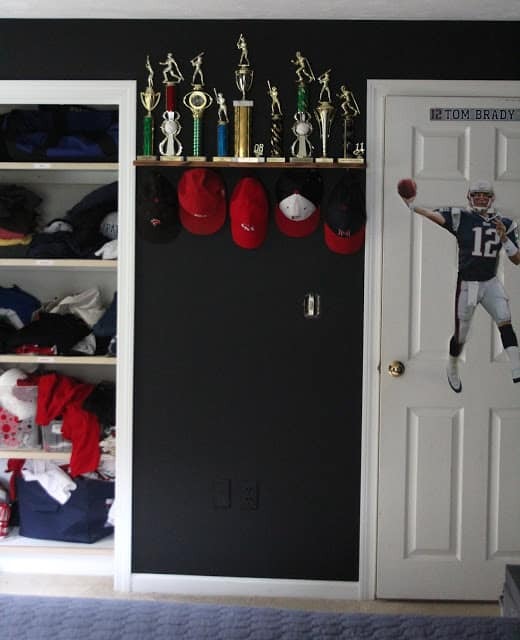 The “picture ledge” on top is a 4″ board that runs around three walls of the room for sports memorabilia and whatnot. The fourth wall is a big chalkboard wall that I have fun plans for. 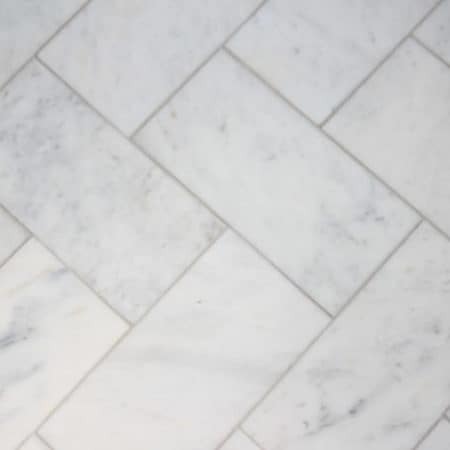 Here is the picture ledge in progress. After mulling over bracket options I went with L brackets spray painted black. 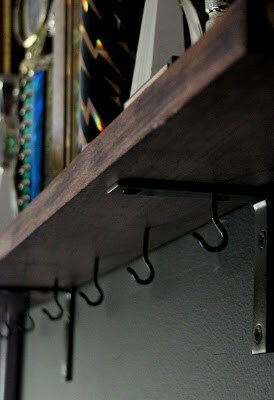 Their squared off shape compliments the metal of the shelves and I like that simple industrial vibe. To the underside of the picture ledge on this wall I added small ceiling hooks for a few of Peter’s hats. He’s got some serious nostalgia going on over here with Little League and Pop Warner trophies from his younger years. Under the hats I added hooks for towels and jackets. (and as you can see it is all splotchy and weird). SO MANY OTHER THINGS TO FINISH!!!!! Peter had the idea to hang his snowboard on the wall and I loved that. I’ll show you my easy DIY hanging method soon. I made this one in about 45 minutes one day and this picture is deceiving – it’s just bad. bad bad bad. Have I maxed out on stained wood for this room? 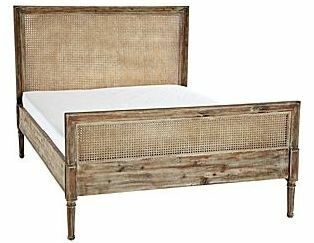 The other DIY I was considering is a headboard inspired by the Harbour Cane Beds from Serena & Lily; imagine one of these in a warm and darker stain. I’m thinking I could take this on. But again – there’s the issue of how much of a good thing is too much? I already have stained wood on three walls of this room. Most likely I will go with another upholstered headboard if I can decide on fabric. That’s Peter’s vote and it would also be the easiest to tackle at this point in the game. It sadly still looks like this but I have some cool and funky DIY hardware all ready to go! OH! Remember the honey-toned desk? While I liked the wood tone with the black walls it was just too HONEY, and it was a bit too big for the space. 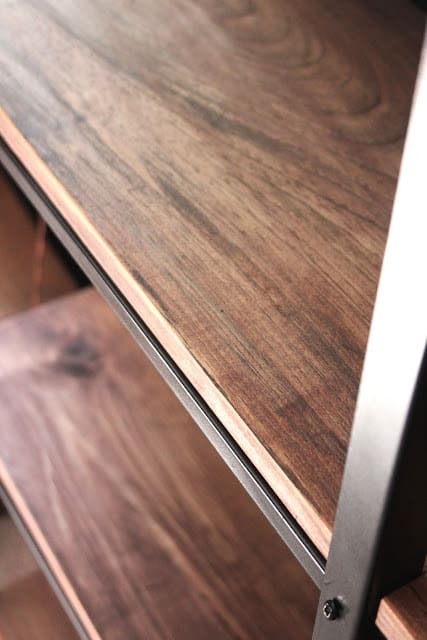 SO…….I also created a simple desk that will have metal supports. I can’t wait to get this installed when it’s final coat of poly is dry! That’s the scoop on the MoodyMasculineMightyMakeover so far! 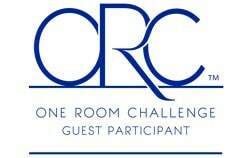 Don’t miss all the other exciting One Room Challenges at Calling It Home! 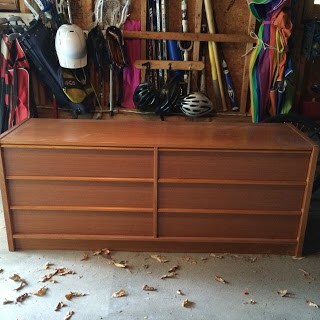 2 // Rehab new short-and-long dresser. 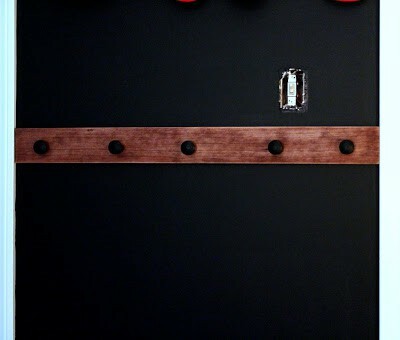 3 // DIY a headboard. 4 // Build wall of shelves for storage and photo/art display. 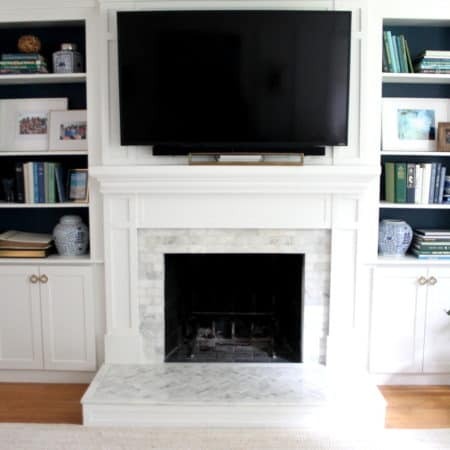 5 // Install a picture ledge around room. 6 // DIY storage bins. 7 // Address the lighting. 8 // Figure out the desk area. 9 // The big surprise art project. 10 // Chalkboard wall fun. 12 // And hopefully by November 12, a happy client! LOVE all the stained wood with the black! 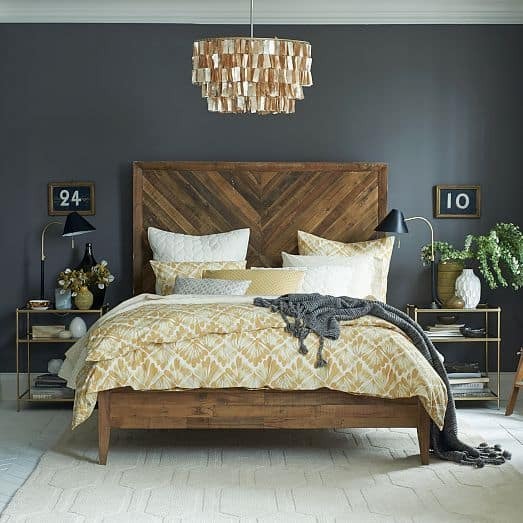 I love the first wood headboard, and no I don't think it would be too much, but if Peter wants the upholstered then I guess you should go with that. 🙂 It is looking sooo good!! I love, love, LOVE the black with the dark wood! It looks amazing! And I can't believe you would take on a caning project…. you are a better woman than I!!!! 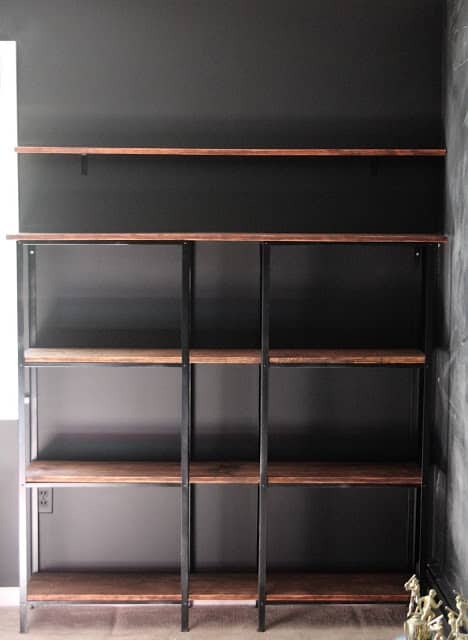 Those shelves look fantastic! 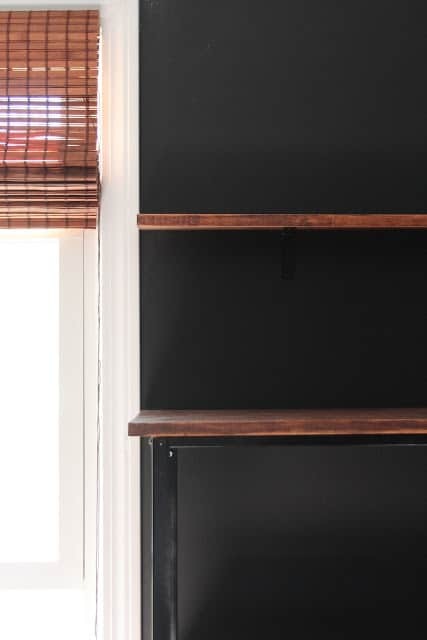 And every time I see the progress on this room I swoon over the black walls all over again. You've been busy, wow! The shelving looks awesome, I love it! 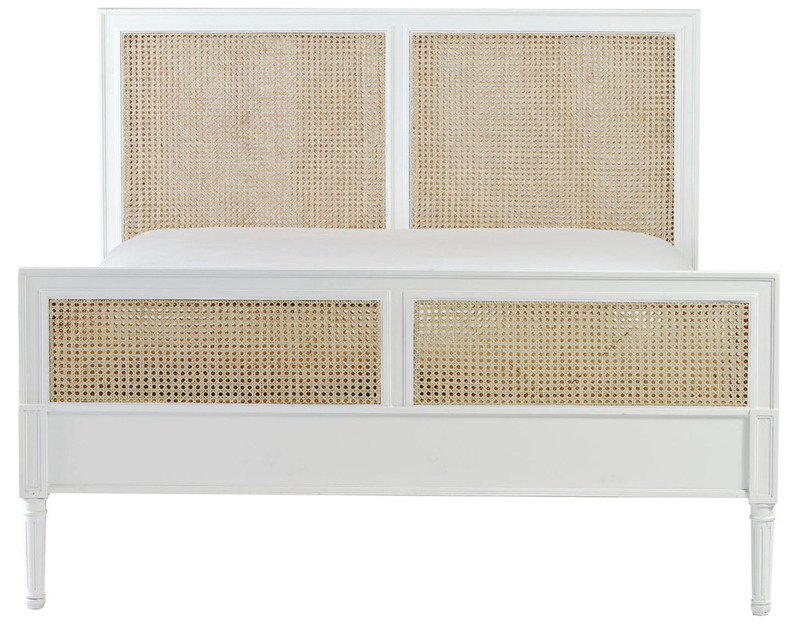 Boo to the headboard failing though, that stinks. I love your ideas but you are right, you don't want wood overload in there. keep up the great work friend! You have made a ton of progress since the last post!! Love the stained wood shelves, awesome look! Are you kidding me? How in the world did you manage to get this all done? You are my DIY idol. I'm loving this! You've gotten so much done already! I love everything so far and I can't wait to see the final reveal! At this point, I think I would stick with the upholstered headboard idea. I think it'll look great in there and it'll definitely be easier. The walls and the shelving look sooo good! I am getting all kinds of great ideas! WOW! That bed is amazing – I want that wood headboard for my room! 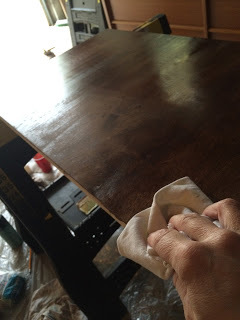 All your staining really looks great – what stain is it? I really like the colour. You're making great progress! That's so cool adding all the hooks…really coming along!!! This looks AMAZING Lisa! I LOVE the color of that wood with the dark walls! Stunning! The black walls look fabulous!!!!!!! 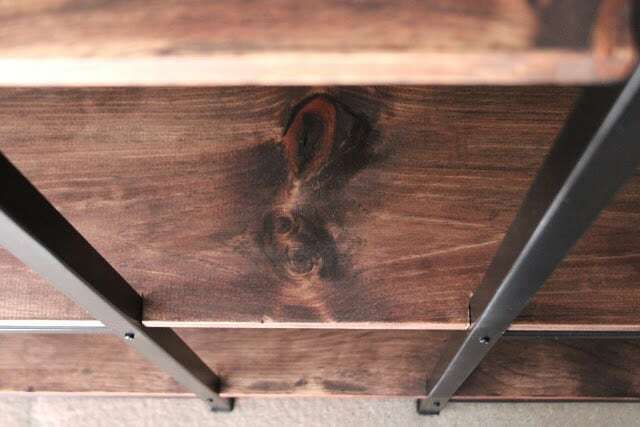 Casey the stain is 1/3 Dark Walnut, 2/3 Jacobian (Minwax) with heavy sanding and distressing in between coats! I think that beautiful stained bed would play so nicely with his shelves! I love how you're displaying all of his personal treasures. Keep going, you're almost there!